The upper and lower Butchers and Scabby Rock quarries were situated on Llynclys Hill above the A495 road on land belonging to the Earl of Powys. They were also known as Llynclys Hill quarries. Somewhere nearby was another small quarry known as Jones's. 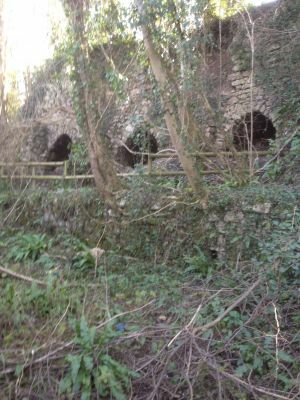 Near the railway level crossing and close to the road are the remains of a bank of 3 kilns which served these quarries. The limestone was burnt here to make lump lime for agricultural purposes. Another open hearth kiln is still standing in the garden of the house called "White Rock" at the junction to the road to Sweeney Mountain, with some old workings to the rear. The main quarries were operating in 1924 under the ownership of Edwin Vaughan who took over the operation from D. Jones. The quality and overburden must have been a major problem for these small quarry owners. It is believed that these operations ceased about 1930. 1924 Builders & Scabby Reds Quarry operating by Edwin Vaughan from D.Jones. Quarry closed 1925-30? 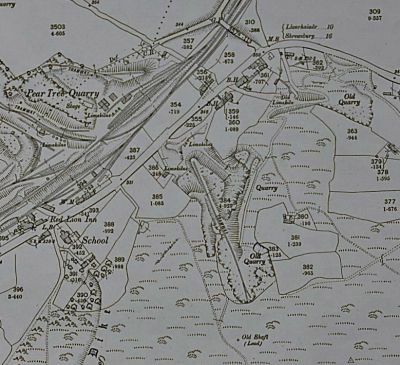 1901 map showing Scabby Rock/Butchers Quarry with a long tramway leading from the quarry face down to two sets of kilns, one a bank of three, the other a bank of two. 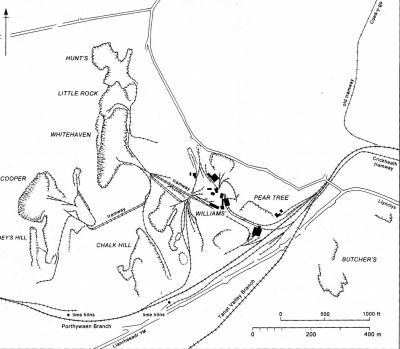 Bank of 3 lime kilns as shown on the above map north of the tramway leading down from Butchers quarry.